In 2012, 4.6% of the U.S. workforce (about 6 million people) worked in occupations classified as S&E, an increase from the nearly 5 million S&E workers in 2003. 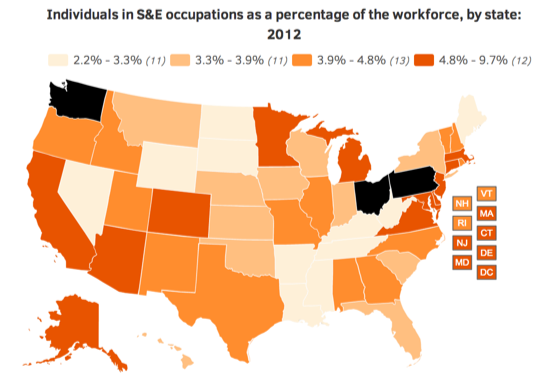 At 9.7%, the District of Columbia had the highest percentage of the workforce engaged in S&E occupations in 2012. Virginia (7.6%) and Maryland (7.2%), the two states adjacent to the District of Columbia, were among the 4 states with the highest percentages of S&E workers. The other two were Massachusetts (7.2%) and Colorado (6.7%).